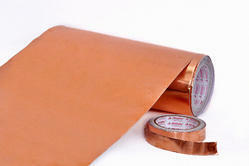 We are engaged in production of fine quality copper tape which is made from oxygen free high conductivity copper. It is useful to shield many electrical components and very popular in earthling and grounding industries. These are widely applicable in switch terminals, electrical conductors, etc. and known for their high efficiency and durability. These are even used by crafters in stained glass and mosaic work.